The key to Good Mobility is having One Main City in the center of the state along with all of your other alliance mates about 20 miles from each other. Then you try to place all of your Other Cities around the outside border of your state – sort of like a Wagon Wheel or a Hub. All Outer Cities should keep a decent amount of troops in them and enough food for a day or two and only enough wood and iron to build troops. Troops in Excess of what you feel you need to keep a properly defended city should be Sent along with Excess Resources to your Main City. City placement in Evony is Crucial to being a mobile player with the ability to attack and defend in all areas of the state that you occupy. With the Majority of your Troops and Resources in the Center of your state you are always ready to Send LOTS of Troops or Resources ANY WHERE in your state to Aid one of your own cities or a city belonging to a fellow alliance member without having to wait 2 hours for them to arrive! 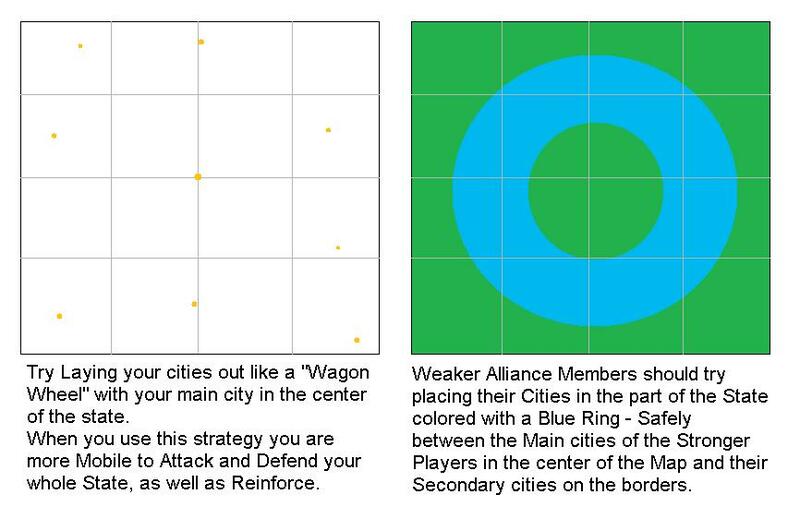 Cities around border Don't have excess Resources lying around making them a target for nearby Hostiles. If all players in an Alliance use a Hub, enemies have a hard time slipping in over the borders. A spread-out network of cities keeps your farming areas from being shared. Having your cities set up in a hub rather than clusters helps keep you from having multiple cities attacked simultaneously. I hope you now see the benefit of using a Hub when placing your Evony Cities! Don't forget to Like! this post and share it with your fellow alliance members!